You need a new weed trimmer. But, you don’t want one that is gas powered and creates pollution, and you don’t want to drag a heavy electrical cord around behind you while you work. What other option is there? Well, you can get a battery powered trimmer that uses a rechargeable battery. You get the best of both worlds that way, with a unit that is lightweight, has no heavy cords, and won’t hurt the environment. You can have all of this with the EGO Power ST1500 56V lithium-on cordless, brushless string trimmer. 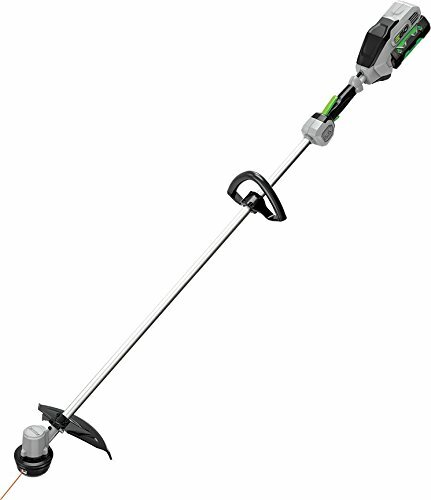 It has a straight shaft, and a 15-inch span so you can cut a wide path and get a lot done in a short amount of time. To save money on packaging and shipping costs, this trimmer is made a bit differently than the rest. The savings are passed down to you, the customer, so you get a quality trimmer that isn’t going to bust your wallet. Less packaging also means less waste to sit in landfills, which makes it a lot more environmentally friendly than other trimmers. This trimmer comes folded in half. All you have to do is unfold the straight shaft, insert the two Allen screws (supplied, along with the wrench), and you’re good to go. It is meant to stay assembled, so you don’t have to take it apart after you are finished using it. Upgraded Line – The EGO 12 went through a lot of line quickly. The EGO 15 uses an upgraded line (from 0.08” nylon to 0.095” twist line). It is nearly 20 percent thicker than the line used in many other trimmers, so it isn’t going to be “eaten up” nearly as quickly as the thinner line. This is the type of line that is used in professional trimmers, and you get to use it too. 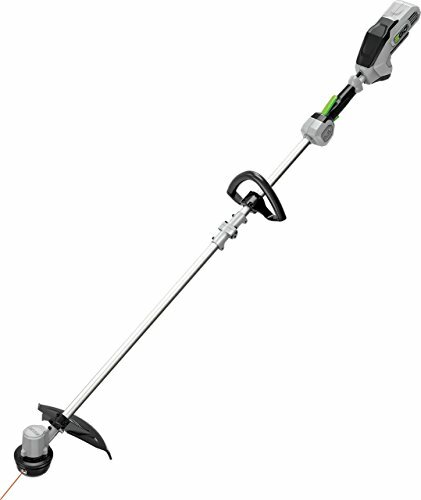 Battery – This trimmer uses a 56V 2.0 Ah battery, which is installed on the rear part of the trimmer, in back of the handle and trigger. It is easy to slide the battery right in, and you will hear a click that lets you know it is firmly in place. When you are finished working, simply remove the battery and put it on the charger. ​Trigger – The triggers have been redesigned for the EGO 15. The trigger and lock off lever are much like what you would find on an ECHO or Toro model. It is more sensitive than other triggers, so it takes very little effort to use, and you have more control over your trimmer while you are working. ​No Internal Spinning Shaft – The brushless motor sits right on top of the spinning cutting head. So, you don’t have to worry about having any spinning shafts inside the trimmer. The fewer moving parts there are, the fewer things you need to worry about breaking down and needing repairs or replacement. Handle Padding – You don’t have to worry about getting blisters on your hands while you are working. This trimmer has a padded handle that makes it a lot more comfortable to hold and use than other trimmers. Of course, it is still a good idea to wear gloves while you are working, because you may end up having to handle branches, thorns, etc. There is a 5 year limited warranty on all EGO outdoor power equipment, and a 3 year limited warranty on all EGO Power+ system battery packs and chargers that are purchased through EGO authorized retailers. Lots of great things can be said about the EGO ST1500. But, just like any product, there are some things that users have complained about. Before you can make an educated decision about any product, including a garden and lawn trimmer, you need to be aware of both the good points and the bad points. With this in mind, let’s take a look at the pros and cons to consider about this trimmer. Ease of Use – One of the thing we really like about this trimmer is how easy it is to use. There aren’t even any On/Off controls. All you have to do is insert the battery, hold onto the safety lock-off lever, and pull the trigger. It doesn’t get much easier than that. It does take about a second or so to get up to maximum RMPs, but what’s a second? Trim Anywhere – You can trim just about anywhere with the EGO 15. You can even trim the tops of your hedges in just a few minutes, even if they are going over a retaining wall. It can easily cut through the most stubborn of vines and weeds to make every inch of your yard look terrific. ​Comfort – We love how comfortable this trimmer is to use. Not only does it have a comfortable, padded handle, it is lightweight and easy to lift. If you have to work on something that is above your head, you will have no problem when you use this trimmer, even if you have to work for any serious amount of time. Thicker Line – You don’t have to worry about line breaking or the trimmer going through too much of it. This thicker line is sturdier, and will cut through a lot more. You will be saving money in the long run, because you won’t be using nearly as much line as you would with other trimmers. Can't find any – Maybe one of the biggest drawbacks of this trimmer is the relatively high cost of the battery. If you intend to obtain other tools, or already have other tools from this range, then you will already have a suitable battery and charger. If you have been considering getting a battery powered lawn and garden trimmer, but worried about how much power you would have and how much work you could actually get done in one session, worry no longer. The EGO Power + ST1500 is just the trimmer you need. It has all the power you need to get your lawn trimmed in short order.